Sting and Trudie Styler, his wife, performing 'Twin Spirits', a theater project, last month at Jazz at Lincoln Center. This gang, he learned after finishing his song, was a claque that expected to be paid for its applause, and most assuredly was compensated for the cheers it delivered for his second number that night. If any claques remain at the Metropolitan Opera, Sting said with a chuckle: "I'm paying them, believe me. Out of my own pocket." It's a joke, of course: the only dissonant tones likely to be heard at the Met when Sting plays his first-ever performances there on Tuesday and Wednesday with the Royal Philharmonic Concert Orchestra of Britain will be coming from audience members trying to sing along on "Roxanne." It is also a reminder from this former Police singer and bassist turned phenomenally successful pop singer that he is still capable of being humbled. That quality may not be immediately visible in his sumptuous Central Park West duplex, where on Thursday he was taking a break from his tour and preparing for the release of a new album, 'Symphonicities', containing orchestral arrangements of his songs. And if that same eclecticism has led Sting far from his origins as a rebellious rocker, he knows how it makes him look to some listeners. "Of course I do," he said. "I come off as being pretentious and all that stuff. Don't care." Sting, 58, said the appreciation for classical music he cultivated from the piano playing of his hairdresser mother and BBC radio of the 1950s was not something he could readily confess to back in his Police days. "It was frowned upon," he said, "and that's the whole ridiculous premise of rock 'n' roll becoming this Taliban-esque, closed thing. 'You can't do that, you can't do that.' What's the spirit of rock 'n' roll except freedom - freedom to do whatever you want?" More recently his musical wanderings have led him to such disparate destinations as 'Songs From the Labyrinth', his 2006 album of Elizabethan lute music, and 'Twin Spirits', a theater project in which Sting and Trudie Styler, his wife, read the correspondence and joint diary of Robert and Clara Schumann. What unites these endeavors, Sting's friends and colleagues say, is his authentic interest in them. "There are people that you think, 'Oh my God, what are they doing now?' " said Allan Buchman, the artistic director of Culture Project, which recently presented 'Twin Spirits' at the Allen Room at Jazz at Lincoln Center. "They should have stopped with what they originally accomplished." But in Sting's case, Mr. Buchman said: "He's gifted enough to take people on a journey with him and have him feel satisfied that they went along. I don't think he's toying with this stuff." Reviewing 'Twin Spirits' for The New York Times, Allan Kozinn wrote that it might be "easy to see 'Twin Spirits' and shows like it as Music Education Lite," but to Sting and Ms. Styler's credit, "they endowed the Schumanns' letters with a sense of the emotion behind them." Even a seemingly straightforward and potentially middle-of-the-road album of orchestral music presents challenges, said Rob Mathes, a composer and arranger who produced 'Symphonicities' with Sting. On the one hand, Mr. Mathes said, such a record could end up being nothing but ballads, "where it's all lush and warm, beautifully voiced chords from the first song to the 10th song." Or, he said, the music could be overwritten, "being as much about the arranger's record collection as it is about Sting's songs." 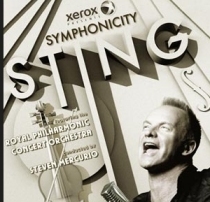 Sting said his goal was simply to see an orchestra play arrangements that would "have steam come out of their ears." It also returned to the meaning of the word pretentious, which Sting pointed out comes from the same root as the word pretend. Though he embraces the label, Sting said: "I'm not pretending anything. I'm curious, I'm finding out. I'm enthusiastic about stuff." He added, "What am I supposed to do, stay in my box?," cheerfully punctuating the remark with a vulgar phrase more closely associated with his punk-rock days. Besides, should Sting ever want to deflate his ego, all he has to do is step outside his apartment, where he said the city's denizens are by and large unimpressed by his fame. "I have a feeling that all New Yorkers, no matter what they're doing, are in their own TV series with their own theme music, and you are merely a guest on their show," he said. Slipping into a raconteurish American accent, he said: "Hey, I've got Sting on my show tonight, folks." Returning to his natural voice, he added: "We're all celebrities in this town. I find it very comfortable."